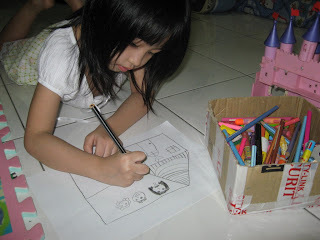 Is a norm for the girls to look for the Daddy first thing they wake up in the morning (they are betul betul daddy's girls), my answer to them is "Daddy has gone to work". 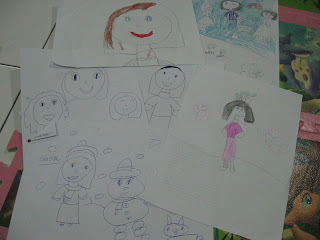 Somehow they understand but deep down their hearts they miss their Daddy very much. 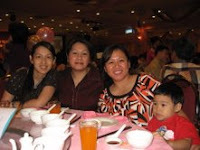 Clet did not disappoint them for their long wait for the Daddy to come home after 2 days outstation to Sandakan. He brought back some goodies, Strawberry stickers, plastic wraist bands and a set of battery operated Walkie Talkie featuring Winnie the Pooh for them (something different from the usual girly stuff). Crystal was very eager to try it out while Pearl is still too little to operate it, she prefered to keep it in the pack after a few trails and shifted her interest onto the goodies instead. April Fools' Day falls on April 1. Its origins are uncertain till today. Most people take chances to play a joke or some involve hoaxes as long as they are harmless. Many people fall into the jokes of others without realising it. In the Museum of Hoaxes, there list a "Top 100 April Fool's Day Hoaxes of All Times", I've selected #8 and #36 for your reading pleasure which I too find them to be real. #8. The Left-Handed Whopper. In 1998 Burger King published a full page advertisement in USA Today announcing the introduction of a new item to their menu: a "Left-Handed Whopper" specially designed for the 32 million left-handed Americans. According to the advertisement, the new whopper included the same ingredients as the original Whopper (lettuce, tomato, hamburgepatty, etc. ), but all the condiments were rotated 180 degrees for the benefit of their left-handed customers. The following day Burger King issued a follow-up release revealing that although the Left-Handed Whopper was a hoax, thousands of customers had gone into restaurants to request the new sandwich. Simultaneously, according to the press release, "many others requested their own 'right handed' version." #36: Big Ben Goes Digital In 1980 the BBC reported that Big Ben, in order to keep up with the times, was going to be given a digital readout. It received a huge response from listeners protesting the change. The BBC Japanese service also announced that the clock hands would be sold to the first four listeners to contact them, and one Japanese seaman in the mid-Atlantic immediately radioed in a bid. So, no matter where you happen to be in the world on April 1, that's tomorrow, don't be surprised if April fool's jokes or hoaxes fall upon you. Just be prepared. This strawberry flavoured bread roll was brought all the way from Manila by brother in law, Edward, who visited the Philippines for a few days. It was delivered to us moments after he arrived in KK. It looked like a swiss roll but taste more like bread than cake, that's why I called it bread roll. Well, it is something different from what we normally have here. That's how it looked like after slicing it. A pack of popular dried mango. Another pack already in our tummy. Is a must buy product whoever visited the Philippines. It's simply a delicious finger food but diabetic should not touch it. I got a Superman T-shirt while Clet got an Orange T-shirt. We would like to thank Edward for his thoughtfulness. He looked pretty exhausted after hours flight from the Philippines. Today is all about blogs hoping, cooking, and eating. I stayed at home with my girls the whole day as Clet had been out since 9am to take some photos for the forthcoming grand properties public auction sales tentatively set on 26th April 2008 was only back around 6pm. The girls miss him terribly. What did I cook today? 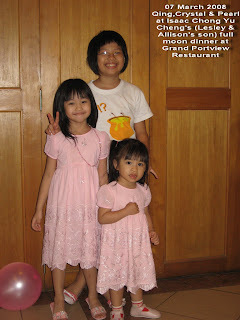 Since I am prepared to stay at home whole day long, I have to make sure there are sufficient food for the girls. In the morning, I fried garlic rice with butter, my girls like it very much. To make sure there is food for lunch, I cooked porridge with lean pork and liver in the National rice cooker by using the porridge mode, it is so convenient that the next moment I open up the cover, porridge is all ready to be served. In between meals my girls had swiss rolls, bread, jelly, their favourite vitagen and of course 2 bottles each of Dumex formula. We had mee udang fried with garlic for dinner. The meals for today are all easy to prepare, allowing me to have time to do some blogs hoping which is a good chance to get to know other bloggers. 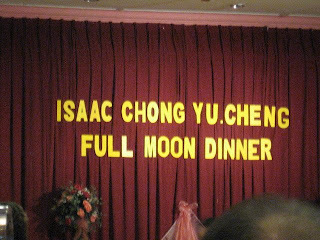 While already suffered from gout, Clet irresistably feeding himself with Chinese mushrooms and lamb satays at cousin's house on Monday night. His ankle became even swollen and pain started to set in after that. Thanks to his sister, Rosalind, who came by to visit us and telling him that taking berries juices would help in gout; strawberry, cranberry, blueberry, just to name a few of berries that are common to us and just by drinking their juices will see the result. Clet was really worried that he couldn't walk the next day and out of curiosity he went to find some berries juices at Merdeka Supermarket just before it closes. Among other berries juices, he chose the "Sunfresh Apple Cranberry Juice Drink" for RM4.90 per 1 litre pack. It is made from reconstituted apple and cranberry juice, sugar, citric acid and flavouring. Believe it or not, the swell as well as the pain have obviously reduced and he felt much relieve the night itself. Study has showed that cranberries had high antioxidants contain than any other fruit. Several of cranberry's polyphenol antioxidants are procyanidins, the same family of pigments that make cherries red. However, because cranberries are so tart, their juice has to be diluted and sweetened to be palatable. A diluted Cranberry-juice cocktail contains just 27 percent of berry juice is still the second-most potent source of antioxidants after grape juice. As such it is a good source of antioxidant for the prevention of urinary tract infections as well as to fight cancer, heart related diseases, diabetes, and also help to increase the high-density lipoprotein (HDL) cholesterol—the so-called good cholesterol too. Gout sufferers should try this out to feel results. 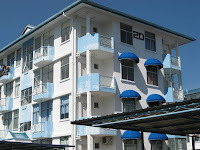 Thinking of buying properties for investment or self occupancy? Why not look into properties put up for public auction sales? There are chances that the values of the properties are cheaper than market prices especially those that have been put up for auction sales for more than two times. As quoted by the "Home Finder" magazine on its July - September 2006 issues with regards to auction sales as saying that "There is a very high chance of succeeding in buying the property that you want at a bargain price as the reserve price of the property can often be below the current market price once it has gone through a few rounds of auctions and especially when you are the sole bidder for the property". There are possibilities that the above three properties would be auctioned again in the near future with a reduction in reserve prices. The advertisement of the Proclamation of Sale for any public auction sales by Mega Auction House will be published in the New Sabah Times from time to time. So interested buyers please look out for the forthcoming GRAND auction sale advertisements and give yourself a chance to save on thousands of Ringgit on investment in properties. Feel like having a bowl of hot and yummy soup noodle? How about this one? Would it make you hungry just by looking at it? Hmm..it’s so delicious. It is just like the one served by the restaurant which could easily cost up to RM5.00 per bowl. Well, it is only a home cooked MAGGI Asam Laksa soup base Instant Noodle, yum..that’s my favourite. I added lots of tomatoes, some green vege and an egg to enhance the taste and nutrition to my breakfast on last Sunday since I was craving on having one. Sometimes I could finish two packets myself. I am sure as a typical Malaysian, you could find a packet or two or more instant noodles some way in your kitchen ready to fill up our hungry stomach anytime. Besides the well known MAGGI brand, there are other brands which are equally delicious, it also depends on how it is cooked. Mi-Sedap, Myojo and Mamee brands of instant noodles are also well-loved by both Malaysians and Singaporeans. A study conducted by the World Instant Noodles Association (WINA) shows that malaysians are among the top 11 on the demand of instant noodles while China, Hong Kong being top on the list. Though instant noodles are usually eaten at home, they are also becoming increasingly popular at Kopitiam, cafe, Indian coffee shop and mamak stall. 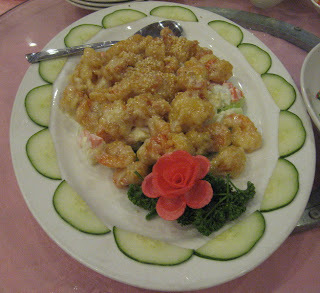 These meals are usually modified according to the customer's or chef's taste. 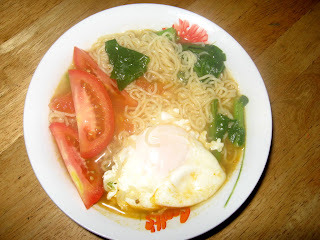 When we talk about instant noodles, the nutrition factors come into being, generally they are often criticized as being unhealthy or junk food. Studies show that A single serving of instant noodles is high in carbohydrates but low in fiber, vitamins and minerals, high in saturated fat and trans fat due to fried as part of the manufacturing process. It is also high in sodium and contain monosodium glutamate (MSG). They could also contain other harmful substances like dioxin, oxidized fat and oils that are health hazard substances which induce neurotoxins and which make neurocells hypoactive. Whatever it is, instant noodles are not to be consumed excessively due to major concerns on health drawback. Our dear niece and nephew, Kathleen and Edson, were baptised on Saturday, the eve of Easter at the Sacred Heart Cathedral recently. Both of them had gone through a 1-year bible study class at the church, they are very dedicated and very eagerly looking forward to this special episode of their new life with the Lord, Jesus Christ. 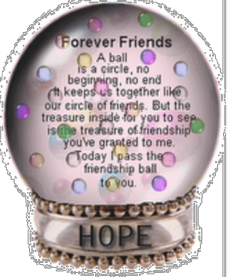 I am pleased to be the God Mother for Kathleen (my first God Child) for that I specially hand made a Rosary for her with a message : "Dear Kathleen, May the Lord God, Jesus Christ be your guide and light all through your life, from God Mother, Aunty Agnes." 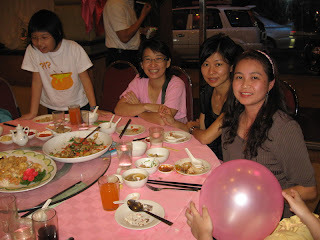 We are so pleased that two of our aunties who live in Canada and Hong Kong repectively flew back to KK for a reunion. 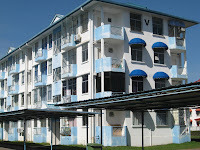 They arrived here on 13 March 2008 for a 2-week stay. Their last visits to their hometown here was about 12 years ago. Kids are growing up each day, same go to their feet sizes. Without realising it, my girl old shoes had either worn out or do not fit anymore. She, particularly likes shoes with heels, though they may look pretty and cute, we always try to avoid the heels when buying shoes for her because not only it is difficult for her to walk in heels, they are particularly bad for proper foot development. It was not easy to get a pair of suitable shoes for the growing feet. We usually allow her to choose which shoes she prefers and of course with certain conditions laid out by us. After trying a few pairs, she chose this one, she likes the colour and the design, of course, most improtantly she feels comfortable with them. It does look nice on her little feet though. 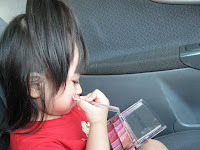 This one cost RM35.00 (after 10%discount), gosh..it costs as much as adults' shoes. With the rate of our children outgrown their shoes, guess most of us are tempting to buy shoes that are one size larger so they can wear them a little longer but shoes that are too big can cause a child to trip and develop foot problems while trying to walk in shoes that are too large. Obviously, it is also problematic with shoes that are too small. 1. Children's shoes should some fastening system, like laces, try to avoid backless or slip-on shoes for kids. 2. Shoes made from canvas or leather are more durable and they are of breathable materials, they will help to keep the child's foot cooler and dryer, helping to prevent blisters, discomfort, and smelly shoes. 3. While they may look cute and pretty, always avoid heels on children's shoes. Not only is it difficult for kids to walk in heels, they are particularly bad for proper foot development. When it comes to children's shoes, stick with flats and even soles. 4. Look for a pattern or textured sole, as this will provide traction and help prevent your child from easily slipping on slick surfaces, on top of that soles should be sturdy and thick enough to protect the feet from pain and injury, but the sole also needs to be flexible too so that it will bend with the foot. What's your rating for me?? It’s almost mid night, the girls had just gone to their dreamlands. Clet grabbed one of the DVD brought in by Victor and off he went to enjoy his movie time alone (he knows me well enough that I do not fancy action movie). He seldom has the chance to watch his movie while the girls are awake cos the TV is always on with their favourite programmes. 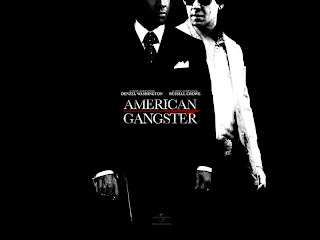 After the show time, he briefed me a bit on what the movie was about, sound like he enjoyed the AMERICAN GANGSTER, starred by Denzel Washington, Russell Crowe, and many others. 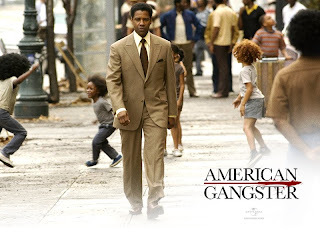 Here's the story, "Nobody used to notice Frank Lucas (Oscar winner Washington), the quiet driver to one of the inner city's leading black crime bosses. But when his boss suddenly dies, Frank exploits the opening in the power structure to build his own empire and create his own version of the American Dream. Through ingenuity and a strict business ethic, he comes to rule the inner-city drug trade, flooding the streets with a purer product at a better price. Lucas outplays all of the leading crime syndicates and becomes not only one of the city's mainline corrupters, but part of its circle of legit civic superstars. Richie Roberts (Oscar winner Crowe) is an outcast cop close enough to the streets to feel a shift of control in the drug underworld. Roberts believes someone is climbing the rungs above the known Mafia families and starts to suspect that a black power player has come from nowhere to dominate the scene. Both Lucas and Roberts share a rigorous ethical code that sets them apart from their own colleagues, making them lone figures on opposite sides of the law. The destines of these two men will become interwined as they approach a confrontation where only one of them can come out on top". Visit here for more preview http://www.americangangster.net/. A cup of 5 in 1 elcafe Premix Instant Coffee and pancakes with tuna mayonnaise spread are not a bad treat for morning breakfast at all. I had these myself yesterday morning to kill the hunger in me. Usually I would opt for mee or meehoon and yesterday I thought well why not make some pancakes for a change since the kids and Clet have been asking for some, furthermore, I could send some for my father too (he is fond of pancake too..). I only use egg, multi purpose flour, water and sugar for my recipe, is simple and economical, yes, economical is the word. Though the pancakes do not look too delicious in the picture (can blame on the bad table setting & presentation) but mind you, Clet had 4 pieces and asked me why I only made that miserable few pieces of pancake. b) Evenly add a sachet of edible Gelatine while stirring briskly with a fork. Continue to stir until all the gelatine granules have dissolved and the liquid is clear and golden. c) Allow the Gelatine mixture to cool slightly before adding 5 – 6 table spoons of Dumex Duglo Strawberry milk powder. Stirring briskly until the milk powder have dissolved. (Just add some condensed milk or sugar if you want it to be sweeter). e) Let it set in the fridge then serve. The girls are so thrilled and eargely trying out mummy's jelly straight from the mould. It's beautiful!! Isn't it?? This pot of light purple exotic beauty was transferred from the orchid's shade to the laundry area by Cletus where he can enjoy its beauty closely and easily (guess what, for that I knocked my head to the pot twice when I was doing the laundry and requested him to move its position at bit). Do you know that these exotic beauties comprise the largest family of flowering plants on earth, with over 30,000 different species, and at least 200,000 hybrids?? Orchids have been characterized as finicky plants that need greenhouses or other specialized care. We do find some orchids are easily grown and bloom with minimal care just like this one. If I could remember, Cletus only water them once in a while and this one turns out to be such a beauty. One of the reasons I like about orchids is their long lasting characteristics. They bloom happily for weeks. 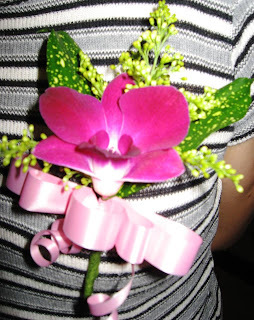 It is the most sought after flower for making corsages for special occasions too. For those who love to grow orchids would find many useful informations from the website nowadays, here are two for your reading pleasure, http://www.fantasyorchids.com/ and http://www.gardeners.com/. Those who care about the outcome of today’s general election would either stick in front of the TV set or radio to get the “first hand” results. Cletus is no exceptional; he is updating each and every result on the newspaper's General Election pages using multi colour text liners to indicate different winning parties. I would pop out to the living room once in while to get some updates from him and pop in back to the bedroom to accompany the girls, they feel a bit neglected by the daddy tonight though …:( only for tonight, girls… Luckily the Barbie’s Princess and the Pauper video CD is on to entertain them so that I could update my Blog a little. It already well after midnight, Cletus is still patiently waiting for the election’s results. 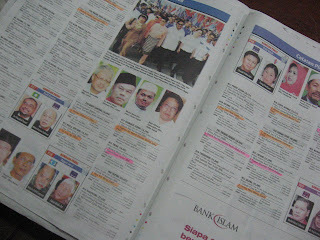 A copy of tomorrow’s newspaper will give a full coverage on the elections anyway kan!! Well guess nothing can compare the thrill of getting the results from the television screen. Don't think he is gonna sleep tonight...!!?? We have been sterilizing feeding bottles and teats since Crystal was born. Initially we used the old method of boiling the bottles and teats but after a while we found out that the bottles and the teats do not last long under the repeated heat of the boiling water and I always get my fingers burned when taking them out from the hot water. 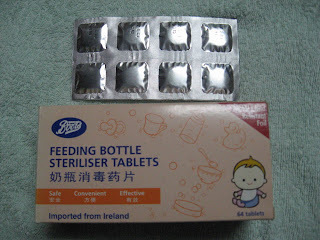 We then try to sterilize the bottles and teats by using the sterilising tablets from Boots. In fact at first I was not pleased with the smell of the solution and there is also doubt of any side effect for my baby by immersing the bottles in this "smelly" water. After reading the directions for use and the benefit of using this method, I am willing to give it a try for it says “Convenient, Safe and Proven Effective”. Guess what, I have been using the product since with that one try. Now I just clean the girls’ bottles and utensils with dish washing liquid and immerse them into the solution until the next feed. It is so much convenient for me. No worries about burning fingers and cracking bottles. 1. Thoroughly clean and rinse the bottle, cap and teat (I use dish washing liquid and brush to clean them). 2. Fully dissolve one Steriliser Tablet in 2 litres of water, using a non-metallic container (I use filtered water and a big Tupperware container). 3. Completely immerse the bottle, cap and teat in the solution for at least 30 minutes before using. 4. Drain the bottle and teat, without rinsing, and then fill with the feed. 5. Renew the solution just once every 24 hours. 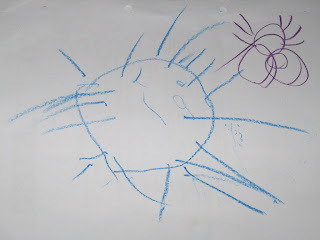 Kids tend to have “many” hands because of their curiosity in everything, they would touch just about anything that they see because by touching and feeling the things that they see would be the most satisfying. 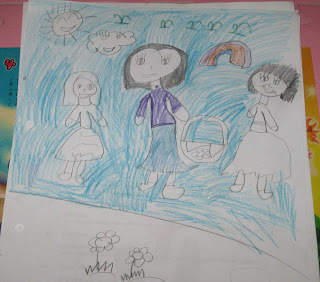 We can not stop them by doing so because these are the learning process of the children. Adults too, aren't we like to take a look at descriptions or ingredients on the shampoo bottles and cereal boxes in the supermarkets? We want to check them out before buying bah.. Since we know there is no way that we could stop our kids from touching and grabbing toys from the shelves at the departmental stores, touching the floor, or the table or chair at the eatery, where dusts and germs are everywhere only our eyes can not see. It is quite impossible to wash our hands immediately all the time, that’s when a bottle of Quicklean Instant Antibacterial hand Gel comes in handy. It can be placed in our bag everywhere we go, it can be used instantly on hands without rinsing. This bottle of Quicklean is given by my sister in law as she knows we have got two very curious daughters, especially Crystal with thump sucking habit and Pearl eating with hands habit. 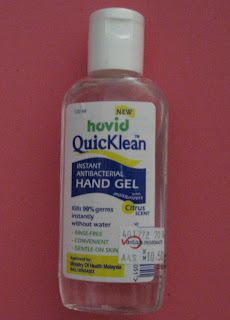 A bottle of hovid Quicklena Instant Antibacterial Hand Gel with moisturisers costs RM10.50. It is a new rinse-free, safe and effective gel that kills 99% of most common germs. There are many other brands for sale at Watsons and Guardian stores. Check them out for more clean hands..!! Children playgrounds can be found in most of the shopping complexes around Kota Kinabalu City these days. I would say there are pros and cons of having the facility in the complexes. I personally find that it would bring much inconvenience to me and hubby. What do you think?? Kids would not be able to resist when comes to playground where they can slide, climb and swing.. Some of the playgrounds having too many kids, especially the one near the food court outside Giant Supermarket, Kolombong. It could be hazardous to younger toddlers, as the possibilities of them being knocked by other older kids are high. Most parents would have to hang around there to accompany their kids, by doing so what they initially plan to do are therefore delayed. Playtime for kids never end. Sometimes we have no choice but to drag our kids away from the playground if persuasions do not seem to work. Most of the time the kid would start to cry and shout in the public which is very unpleasant and un-called for. That’s what happened to Pearl at Complex Karamunsing the other day where we were supposed to attend a birthday party at McDonald invited by Crystal’s classmate. She refused to leave that little playground at 3rd floor where we had spent more than half an hour and it's time to leave for the party. After experiencing few of such situations, hubby and I would try to avoid going near to the areas where playgrounds are situated or even avoid going to complexes with playgrounds altogether. We also wonder whether any maintenance to those playgrounds. Hygiene is another factor to consider too. We always make sure to clean the kids’ hands after visiting the playground, can not afford to pay visit to clinic every now and then.